Teeth should be examined to evaluate possible dental decays, fractures, mobility, defects in restorations, gingival recession and bone loss with inspection, palpation and percussion. The hard palatal mucosa is characterized by keratinized epithelium and covered by a series of fibrous ridges or rugae. The mucosa overlays several minor salivary glands. The lingual frenum is the primary soft tissue attachment of the tongue to the floor of the mouth. Over-attachment of the frenum may result in speech impediments. Intraoral photography with digital camera should be used to document mucosal lesions and evaluate the progression of the disease and responses to therapy. This typically requires 35-mm single lens reflex cameras with macro lens and ring flash attachment. Several models are available for intraoral photos. For patient education resources, see the patient education articles Cancer of the Mouth and Throat and Oral Herpes. The oral cavity is oval shaped and is separated into the oral vestibule and the oral cavity proper. It is bound by the lips anteriorly, the buccal mucosae laterally, the floor of the mouth inferiorly, the oropharynx posteriorly, and the palate superiorly. The oropharynx begins superiorly at the junction between the hard palate and the soft palate, and inferiorly behind the circumvallate papillae of the tongue. The bony base of the oral cavity is represented by the maxillary and mandibular bones. The oral cavity includes the lips (vermillion and labial mucosa), buccal mucosa, floor of the mouth, tongue, hard and soft palate, gingivae, retromolar trigone and teeth. For more information about the relevant anatomy, see Mouth Anatomy, Tongue Anatomy, Tooth Anatomy, Taste System Anatomy, and Lips and Perioral Region Anatomy. Salivary gland pathology of the major salivary glands are best detected by careful palpation of the preauricular skin for parotid related diseases (see the second image below). Extraoral palpation of the submandibular and sublingual glands can often reveal enlargement and tenderness; however, bimanual palpation frequently is more effective. The anterior cervical chain of lymph nodes is frequently involved in both inflammatory oral conditions and metastatic disease. Nodal changes are palpable all along the sternocleidomastoid muscle. Parotid masses (especially in superficial lobe) can be detected by digital palpation. Myofascial and temporomandibular joint (TMJ) pain is commonly encountered in patients. All patients should be examined for possible facial asymmetry and limitation in opening, deviation or guarding. TMJ is palpated for function and tenderness with the mouth closed with the first and second fingers over the joint. The patient is then asked to open and close the mouth repeatedly to assess the presence of any crepitus, symptomatic clicking, or popping. These can also be detected by placing the tips of the fifth finger in the external auditory canals (see the picture below). All muscles of mastication should be palpated for possible tenderness during clenching and at rest (especially the masseter and temporalis which can be palpated extraorally). During the examination, it is important to ask the patient to point out any particular areas of pain (trigger points).The mandibular attachment of the temporalis and medial pterygoid muscles are usually palpated by inserting the second finger into the posterior maxillary vestibule. Crepitation, clicking, and popping of the temporomandibular joints can be detected by placing the tips of the little fingers in the external auditory canals and having the patient perform a series of excursive mandibular movements. A stethoscope placed anterior to the pinna of the ear may be helpful. Both lips should be examined visually and by palpation. The vermilion border is usually smooth and pliable (see the picture below). The vermilion borders of the lips should be smooth and pliable. Ask female patients to remove any lipstick, which may obscure underlying surface changes. As with any other portion of the physical examination, the intraoral examination should be performed in a systematic manner. For many healthcare providers, the examination of the oral cavity is a clinical skill that is acquired only through repetition. Adequate lighting is an essential component for a good oral examination. Dental offices are equipped for such examinations; however, medical practitioners who do not normally utilize fixed or head-mounted examination lights may be forced to rely on hand-held flashlights or a penlight, supplemented by the ambient room lighting. If patients wear removable prostheses these should be removed to perform a thorough intraoral examination. Dentures should be evaluated for fit, general appearance and hygiene. Each anatomic structure should be visually inspected and palpated; possible lesions should be evaluated with respect to size, extent, thickness, texture, color, consistency, and tenderness. The oral mucosa has traditionally been described as salmon-pink in color; however, great variation exists depending on race, vascularity and keratinization. Evert the lips and inspect the labial mucosa (upper and lower) (see the image below). The labial mucosa is typically smooth and glistening. If the mucosa is dry, pinpoint mucosal secretions from the minor salivary glands may become apparent. In healthy individuals, the labial mucosa appears as smooth, soft, and well lubricated by the minor salivary glands. Anxiety regarding the examination (“white coat syndrome) may result in a transient hyposalivation. In such cases, the mucosa may become sticky to the touch. The minor salivary glands of the lower lip frequently are palpable. The lower lip is frequently subjected to injury that can cause trauma to the minor salivary gland ducts, resulting in the formation of a mucocele, a lesion most frequently found in lower labial mucosa/lip. Examination of the buccal mucosa is most easily accomplished by having the patient partially open the mouth, followed by stretching of the buccal mucosa with a mouth mirror or tongue blade. The orifice of the parotid gland (ie, the Stensen duct) can be found as a small punctate soft tissue mass on the buccal mucosa adjacent to the first permanent molar teeth. Some patients may present with mild gray-white lacy lines on the buccal mucosa that disappear with stretching of the mucosa (leukoedema). Another common finding of the buccal mucosa or labial mucosa are the Fordyce granules. These represent ectopic sebaceous glands. Leukoedema of the buccal mucosa. The milky-white appearance of the mucosa represents tissue edema and disappears when the mucosa is stretched. Linea alba (“white line”) is also often observed on the buccal mucosa as a result from chronic trauma against teeth. Linea alba manifests as a horizontal white streak along the buccal mucosa at the level of the occlusal plane bilaterally. The linea alba of the left buccal mucosa at the level of the occlusal plane. The orifice of the Stensen duct is superior to the linea alba, adjacent to the first permanent maxillary molar. Gentle palpation of the parotid gland results in the expression of serous saliva from the duct. Saliva should be able to be expressed from the duct; however, extraoral massaging of the gland may be necessary. The saliva should be clear and watery, and the patient should not experience any discomfort with the procedure. As with the lips, the buccal mucosa should also be well lubricated with saliva. Minor salivary glands and Fordyce granules may impart a granular texture to the buccal mucosa. All surfaces of the tongue should be examined including the dorsum, sides and ventral tongue. The dorsal surface of the tongue is most easily visualized by having the patient protrude the tongue and attempt to touch the tip of the chin. Alternatively, the tip of the tongue can be grasped by the fingers and a 2 X 2-in gauze. The dorsal surface of the tongue is uniformly covered by numerous filiform papillae, as shown below. Interspersed among the filiform papillae are dozens of mushroom-shaped fungiform papillae, each of which contains one or more taste buds, as shown below. The dorsal surface of the tongue is an admixture of thin, keratinized, filiform papillae interspersed with pink mushroom-shaped fungiform papillae. Each of the pink mushroom-shaped fungiform papillae is associated with several taste buds. The circumvallate papillae are at the junction of the anterior two thirds and posterior one third of the tongue. 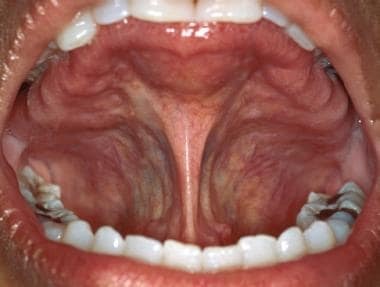 These structures normally are 8-12 in number and are arranged in a V-shaped pattern anterior to the foramen cecum, a shallow depression which represents a developmental remnant of the thyroglossal duct. Like the fungiform papillae, the circumvallate papillae also contain numerous taste buds. 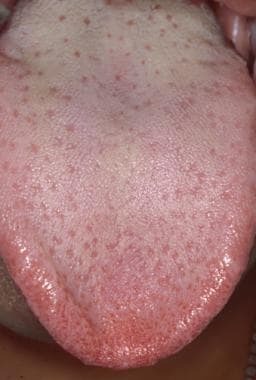 Coated or hairy tongue is characterized by hyperplastic filiform papillae and accumulation of keratin due to increased retention and reduced exfoliation secondary to dehydration. Patients may complain of bad breath and even gagging especially if the coating is localized to the posterior tongue near the circumvallate papillae. Fissuring of the dorsal surface of the tongue has been described in dry mouth or syndromic patients (e.g., trisomy 21); however, the presence of fissuring is of no clinical significance in the vast majority of cases. Atrophy of the dorsal surface of the tongue can be secondary to nutritional deficiencies, some medications (e.g., hydroxyurea), erythematous candidiasis and other mucocutaneous diseases. In addition to discomfort, patients often report altered taste sensations. Foliate papillae are structures present on the posterolateral aspect of the tongue and contain additional taste buds. These can be often mistaken for abnormal tissue as they may vary in size and appearance. The lateral borders of the tongue can be examined by grasping the tip of the tongue with a gauze sponge, extending it, and rotating it laterally. The lateral borders of the tongue are not covered by a large number of papillae. 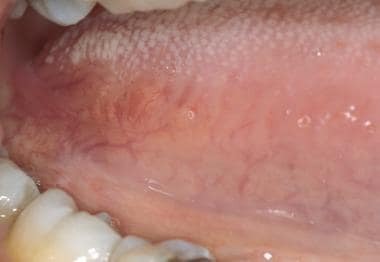 The mucosa is more erythematous and, as one moves more posteriorly along the lateral border of the tongue, vertical fissuring becomes more prominent. Collections of mucosal-colored tissue with a bosselated surface can be found at the base of the tongue. This accessory lymphoid tissue (lingual tonsil) is a component of the Waldeyer ring and may become enlarged in the presence of infection or local inflammation. The lateral border of the tongue occasionally has some associated vertical corrugations, but it may appear smooth and glistening. Lingual tonsils at the posterior-lateral base of the tongue represent the anterior extension of the Waldeyer ring. These tissues may become enlarged secondary to inflammation, infection, or neoplasia. The ventral surface of the tongue is most easily visualized by having the patient touch the tip of the tongue to the roof of the mouth. The sublingual vasculature often is prominent, especially in older individuals. Fronds of tissue, the plica sublingualis, can frequently be observed extending from the ventral surface of the tongue, as shown below. The floor of the mouth, similar to the buccal mucosa, is salmon-pink in color. The orifices of the submandibular glands (ie, the Wharton ducts) are present as 2 midline papillae on either side of the lingual frenum, shown below. The ostia of the Wharton ducts, which are located at the base of the lingual frenum, appear as two bilateral punctate structures. Mucous saliva can be expressed from the ducts with bimanual palpation of the submandibular glands. Saliva frequently pools in the floor of the mouth during an oral examination. This pooled saliva is removed most easily with a gauze. Subsequent bimanual palpation of the submandibular and sublingual glands should result in the expression of saliva from the Wharton ducts. This saliva generally is more viscous than the one from the parotid glands because of the higher percentage of mucous saliva. Both the ventral/lateral surface of the tongue and the floor of the mouth are common sites for oral cancer. An incisional biopsy remains the gold standard to rule out dysplasia or invasive squamous cell carcinoma. The palate is divided into the soft palate posteriorly and the hard palate anteriorly. Direct visual inspection of the hard palate is accomplished most easily with the use of an intraoral mirror. 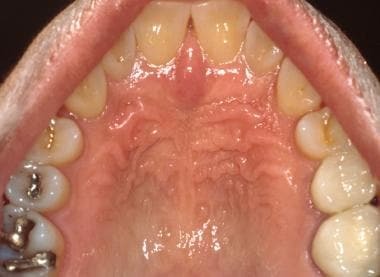 The hard palate, similar to the attached gingiva, normally is less pink than other oral mucosal sites because of its increased keratinization (see image below). The anterior hard palate is covered by numerous fibrous ridges or rugae, (see second image below) and many individuals may present with a prominent midline incisive papilla anteriorly (the opening of the incisive canal). Note the midline incisive papilla posteriorly to the maxillary incisives. This represents the inferior aspect of the nasopalatine duct and overlay a substantial neurovascular bundle that supplies the anterior hard palate. Minor salivary glands are abundant in the hard palate; because of this, a high incidence of minor salivary gland neoplasms, both benign and malignant, is found in this location. In contrast to the hard palate, the soft palate is nonkeratinized and salmon-pink in color. It is easily visible on direct examination by depressing the posterior tongue with a tongue blade and instructing the patient to say "Ahhh." Deviation of the soft palate to one side or the other may indicate a neurologic problem or an occult neoplasm. Once the posterior tongue has been depressed and the patient has elevated the soft palate, examining the oral pharynx is possible. This can occasionally be complicated in patients who have a hyperactive gag reflex; however, in such cases, the gag reflex can be suppressed through the use of topical anesthetics. The tonsillar pillars are visualized most easily by moving the tongue laterally with a tongue blade. The soft palate is not usually keratinized and is more vascular than the hard palate, creating the darker red color. The tonsillar crypts are highly vascular and appear more erythematous than the surrounding tissues. Patients often have accumulations of desquamated epithelial cells, food, and other debris present in the tonsillar crypts, which can lead to a scratchy sensation in the throat and halitosis. Accessory lymphoid tissue on the posterior oral pharynx (adenoids) is normal and appears as pale irregular mucosal papules. These tissues may enlarge in the presence of inflammation or infection. Oral pharyngeal alterations are not uncommon, especially with oral viral infections (eg, herpangina; hand, foot, and mouth disease). The gingivae are examined most easily with the mouth partially closed and the lips retracted with the fingers, a tongue blade, or plastic lip retractors. The attached gingiva (ie, gingiva adjacent to the crowns of the teeth)  is keratinized and appears paler than other oral mucosa (see the first image below). This tissue usually is firm, stippled, and firmly attached to the underlying bone. The alveolar mucosa extends from the attached gingiva to the vestibule. In contrast to the attached gingivae, alveolar mucosa is not keratinized (see the second image below). The attached gingivae are frequently pigmented, the intensity of which is somewhat proportional to the presence of cutaneous pigmentation; however, alveolar mucosa is rarely pigmented (see the third image below). The attached gingiva adjacent to the teeth is keratinized and tightly bound to bone. Healthy gingiva is stippled and resembles citrus rind (peau d' orange). The alveolar mucosa extends from the mucogingival junction to cover the mucobuccal fold. 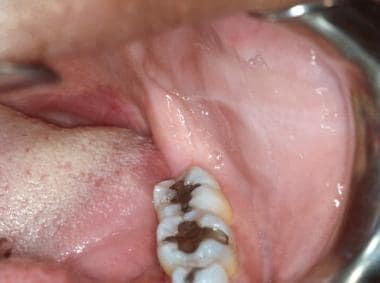 It is not keratinized and often appears darker than the alveolar mucosa. 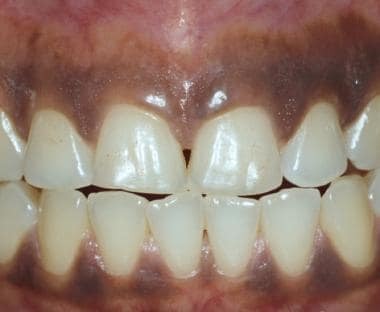 Persons of color frequently have intraoral pigmentation, including the attached gingiva. The amount of pigmentation generally is proportional to the amount of cutaneous pigmentation. When present, racial pigmentation is bilateral. 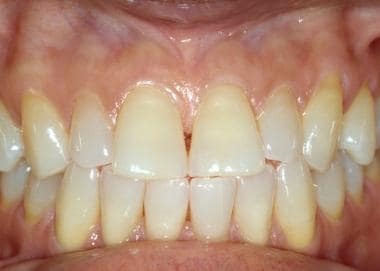 Alterations in the clinical appearance of the gingivae can be an indicator of gingivitis or a systemic disease. The most common cause of gingival erythema is poor dental hygiene. 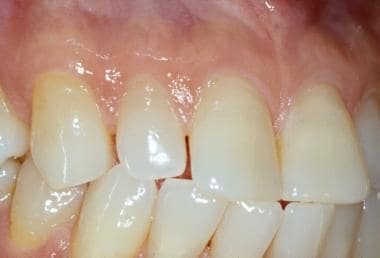 Deposits of dental plaque and calculus result in gingival inflammation and, if not removed, involvement of the underlying supportive structures of the teeth. The presence of retained dental plaque and calculus also serves as a nidus for a number of reactive gingival lesions (eg, pyogenic granuloma). The gingiva is also the initial site of occurrence of mucocutaneous diseases (such as lichen planus, mucous membrane pemphigoid, pemphigus vulgaris). Examination of the teeth should be the final part of the oral examination. The pediatric or primary dentition consists of a total of 20 teeth (2 molars, 1 canine, and 2 incisors per quadrant). The adult, or secondary, dentition includes 32 teeth (3 molars, 2 premolars, 1 canine, and 2 incisors per quadrant). Bacterial culturing is not routinely performed for oral lesions. Cultures (both aerobic and anaerobic) are indicated in cases of suspected streptococcal pharyngitis or following drainage of an abscess by swabbing the purulent material. Cultures may be also helpful in cases of poor response to empiric antibiotic therapy; a sensitivity test should be requested to the laboratory. 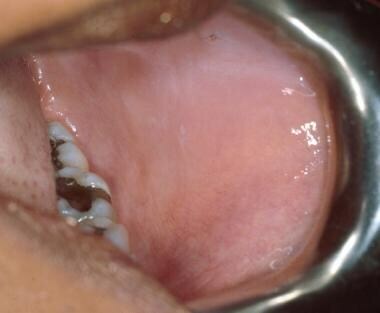 Culturing of oral lesions is conducted most often when a viral etiology is being considered. Fungal cultures can also be taken; however, more cost-effective diagnostic procedures are available. Bacterial cultures are of limited value. Fungal cultures are not obtained routinely. A positive culture for Candida albicans (normally present in 20-30% of the population anyway) is indicative of carriage rather than candidal infection. As such, a fungal culture is usually not indicated for patients where a diagnosis of candidiasis has been already made clinically. Fungal culture for susceptibility tests may be obtained for those patients with clinical signs of fungal infection and who failed empiric antifungal therapy. Cytology may provide helpful information on infectious and non infectious oral diseases. When a lesion is suspicious for Candida infection it can be scraped and smeared on a glass slide. The slide is then treated with lactophenol blue, potassium hydroxide, or other dye (or fixed and stained with Periodic Acid-Schiff), and sent to the lab for analysis under the light microscope to detect fungal organisms. Cytologic smears for HSV infections may show features multinucleated giant cells and “ballooning” cytoplasm. Salivary gland masses, enlarged lymph nodes may be evaluated using a fine needle aspiration biopsy technique. Tissue biopsy is the gold standard for the diagnosis of oral lesions. An incisional biopsy is usually obtained to get a small representative sample, while an excisional biopsy is used to surgically remove and evaluate an entire lesion. Intraoral tissue biopsy is a relatively simple procedure. Adequate lighting is essential. Following informed consent, a local anesthetic (usually with epinephrine) is injected in the area of biopsy. In some patients, a vasoconstrictor is contraindicated because of hypersensitivity or other complicating factors. Topical lidocaine can be applied to the area of needle insertion to minimize the discomfort (see the image below). Local infiltration anesthesia for intraoral biopsies generally is easy to administer. 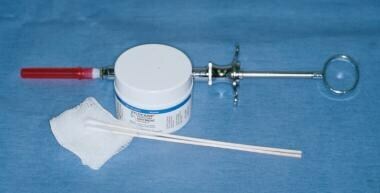 Use of topical anesthesia prior to needle insertion may be used. The selection of the specific biopsy site and biopsy technique is determined on the basis of the presumptive clinical diagnosis and location of the lesion. For example, mucocutaneous diseases require an incisional biopsy to determine the specific diagnosis and appropriate treatment. In such cases, an incisional mucosal punch biopsy (3-4 mm in diameter) is sufficient (see the image below). Space-occupying benign lesions (eg, mucocele or traumatic fibroma) require an excisional biopsy (see the second image below). In cases of non-homogeneous lesions, multiple incisional biopsies should be performed. If the differential diagnosis includes a vesiculobullous disorder, the biopsy should be performed peri lesionally and away from ulcerations. All specimens should be oriented and sent for histopathological examination in 10% neutral buffered formalin. Michel solution should be used for specimens intended for direct immunofluorescence (see the image below). An oral or head and neck pathologist is usually preferred. Interrupted resorbable sutures or use of silver nitrate is usually sufficient to control bleeding. Biopsy punches come in a variety of sizes and in both reusable and disposable forms. Disposable biopsy punches are lighter and more easily manipulated than their metal counterparts. Most incisional intraoral biopsies can be performed with a 3- or 4-mm punch. 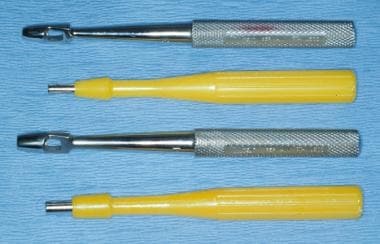 Larger punches can be used for small excisional biopsies. A No. 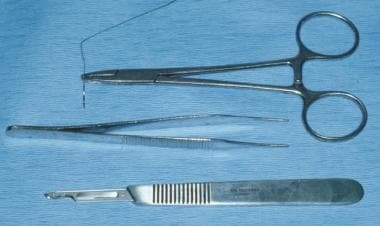 15 Bard-Parker blade, atraumatic forceps, and suture material are used for many oral biopsies and other soft tissue procedures. Because of the vascularity of this particular anatomic site, perform scalpel incisions in an anterior-posterior direction to minimize severing neurovascular structures. Avoid inclusion of the marginal gingiva in gingival biopsies for esthetic reasons, especially in the anterior maxilla. Handle small biopsy specimens with atraumatic Adson forceps rather than mouse-toothed forceps, which can damage the integrity of small mucosal specimens. The small size of most oral biopsy specimens requires that the specimen be placed in the appropriate fixative immediately after removal from the mouth. Ten percent neutral buffered formalin is used for most routine biopsies, and Michel solution is an excellent transport medium for specimens intended for direct immunofluorescence staining (see the image below). Tissue removed from the mouth must be placed in a fixative solution (except for the submission of material for frozen section in the hospital). 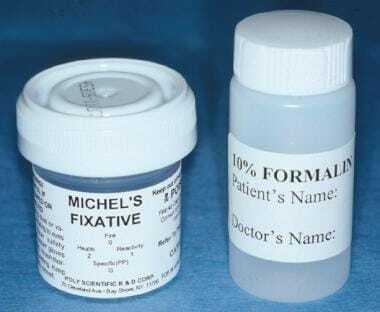 For routine biopsies, 10% neutral buffered formalin is the fixative of choice. For direct immunofluorescence, Michel solution is an excellent transport medium. Consult the pathology laboratory for any anticipated special procedures to ensure that the tissue is handled properly. Chia-Hui Chen C, Chyun DA, Li CY, McCorkle R. A single-item approach to screening elders for oral health assessment. Nurs Res. 2007 Sep-Oct. 56(5):332-8. [Medline]. Vargas CM, Arevalo O. How Dental Care Can Preserve and Improve Oral Health. Dent Clin North Am. 2009 Jul. 53(3):399-420. [Medline]. Humphrey SP, Williamson RT. A review of saliva: normal composition, flow, and function. J Prosthet Dent. 2001 Feb. 85 (2):162-9. [Medline]. Pedersen AM, Bardow A, Jensen SB, Nauntofte B. Saliva and gastrointestinal functions of taste, mastication, swallowing and digestion. Oral Dis. 2002 May. 8 (3):117-29. [Medline]. Kujan O, Glenny AM, Oliver R, Thakker N, Sloan P. Screening programmes for the early detection and prevention of oral cancer. Aust Dent J. 2009 Jun. 54(2):170-2. [Medline]. Perry M. Maxillofacial trauma-Developments, innovations and controversies. Injury. 2009 May 30. [Medline]. Haddad R, Annino D, Tishler RB. Multidisciplinary approach to cancer treatment: focus on head and neck cancer. Dent Clin North Am. 2008 Jan. 52 (1):1-17, vii. [Medline]. Canaan TJ, Meehan SC. Variations of structure and appearance of the oral mucosa. Dent Clin North Am. 2005 Jan. 49 (1):1-14, vii. [Medline]. Goel G, Khadilkar UN, Kumar S. Chondrolipoma of tongue. Kathmandu Univ Med J (KUMJ). 2008 Oct - Dec. 6(24):505-507. [Medline]. Gottehrer NR. The periodontal crown: creating healthy tissue. Dent Today. 2009 May. 28(5):121-3. [Medline]. Seymour RA. Is gum disease killing your patient?. Br Dent J. 2009 May 23. 206(10):551-2. [Medline]. Palacios C, Joshipura KJ, Willett WC. Nutrition and health: guidelines for dental practitioners. Oral Dis. 2009 May 15. [Medline]. Aleksejuniene J, Gorovenko M. Caries detection techniques and clinical practice. Pract Proced Aesthet Dent. 2009 Jan-Feb. 21(1):26-8. [Medline]. Braga MM, Mendes FM, Ekstrand KR. Detection activity assessment and diagnosis of dental caries lesions. Dent Clin North Am. 2010 Jul. 54(3):479-93. [Medline]. Milgrom P, Chi DL. Prevention-centered caries management strategies during critical periods in early childhood. J Calif Dent Assoc. 2011 Oct. 39(10):735-41. [Medline]. Kutsch VK, Young DA. New directions in the etiology of dental caries disease. J Calif Dent Assoc. 2011 Oct. 39(10):716-21. [Medline]. Tejani S, Sultan A, Stojanov I, Woo SB. Candidal carriage predicts candidiasis during topical immunosuppressive therapy: a preliminary retrospective cohort study. Oral Surg Oral Med Oral Pathol Oral Radiol. 2016 Oct. 122 (4):448-54. [Medline]. Leao JC, Ribeiro CM, Carvalho AA, Frezzini C, Porter S. Oral complications of HIV disease. Clinics (Sao Paulo). 2009 Oct. 64(5):459-70. [Medline]. Tognetti L, Martinelli C, Berti S, Hercogova J, Lotti T, Leoncini F, et al. Bacterial skin and soft tissue infections: review of the epidemiology, microbiology, aetiopathogenesis and treatment: A collaboration between dermatologists and infectivologists. J Eur Acad Dermatol Venereol. 2012 Jan 3. [Medline]. Epstein JB, Güneri P, Boyacioglu H, Abt E. The limitations of the clinical oral examination in detecting dysplastic oral lesions and oral squamous cell carcinoma. Tex Dent J. 2013 May. 130(5):410-24. [Medline]. 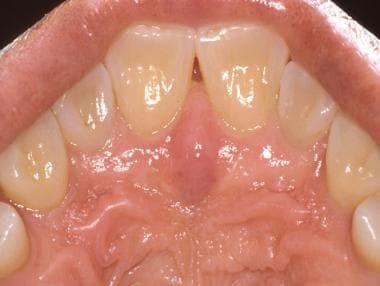 Busko M. Periodontitis Seen Related to Elevated Risk of First MI. Heartwire from Medscape. Available at http://www.medscape.com/viewarticle/857484. January 20, 2016; Accessed: January 27, 2017. [Guideline] US Preventive Services Task Force (USPSTF). Screening for oral cancer: recommendation statement. Agency for Healthcare Research and Quality. 2004 Feb.
[Guideline] American Academy of Pediatric Dentistry. Clinical guideline on appropriate use of antibiotic therapy for pediatric dental patients. American Academy of Pediatric Dentistry. 2005. [Guideline] New York State Department of Health. Oral health management of children and adolescents with HIV infections. New York State Department of Health. Jun 2004. [Guideline] American Academy of Pediatric Dentistry. Clinical guideline on adolescent oral health care. American Academy of Pediatric Dentistry. 2005. The brush biopsy is an excellent procedure to screen benign-appearing oral mucosal leukoplakias to determine the need for subsequent scalpel biopsy. The procedure can be performed without anesthesia. Latex agglutination–based diagnostic tests for Candida albicans have been available for use in gynecology for several years. While not specifically marketed for use in the diagnosis of oral candidiasis, such tests have proven to be very accurate, easy to use, and cost effective.